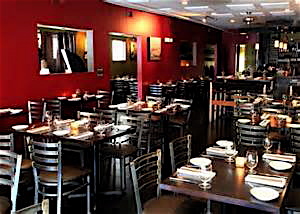 Basa is a lovely Vietnamese bistro located on Frankfort Avenue in Louisville. This is a bohemian section of the city, full of independent, “Do It Yourself (DIY)” types, which Basa fits into nicely, as it has a very approachable atmosphere. It starts with the look. The exterior gives the appearance of an old house, but inside it’s open, with accented natural lighting and smart interior design. It surprises diners upon arrival. The interior is eye-catching, and gives that momentary feel of being transported to another place. The red and olive walls host fetching black and white photographs of street scenes from Vietnam. For those that have visited this Far East jewel – Basa has the look of an inspired bistro one might find in Saigon or Hanoi. It’s not a big place, but is comfortable, and offers plenty of room in between tables so as not to feel cramped. It can be loud, but that is part of its charm, as this is a meeting place. Locals from the neighborhood mix with the downtown set and pre-theatre crowd to sip exotic martinis, swap appetizers and socialize. The food is a modern take on Vietnamese cuisine. The menu at Basa is not designed to compete with the traditional dishes served at Annie’s Cafe or Vietnam Kitchen, but the essence of traditional Vietnamese cooking is at the heart of each item. Basa embraces this same general philosophy to keep it local and keep it fresh, or at the very least keep it seasonal. A few key offerings remain constant, but typically the menu rotates, to take advantage of whatever items are currently in-season. Not surprisingly seafood dominates the menu. The Salt and Pepper Prawns ($22) with roasted garlic and scallion oil are popular. Another traditional item receiving updated touches is the oversized Vietnamese Crepe ($16), stuffed with tiger prawns, Vidalia onions, wild mushrooms, mint, and lettuce. Maia and I dropped by Basa on the way to a show at the Louisville Palace, so we couldn’t lounge as long as we might have liked. We started with two dirty martinis. These first came out smelling like bacon, which is not the swampy odor expected. It was due to the marinated olives the house uses. Our waiter had the bar remix our drinks cleanly – no worries. The waitstaff was excellent on the whole. They were bright, enthusiastic and knew the menu cold. We started with two appetizers. First the Chesapeake Bay Oysters ($16), served over mesclun greens, that come with three dipping sauces, a siracha garlic aioli, a migrionette, and a black bean sauce. The oysters were fried to perfection, with a thin, crispy outer crust, and burst with flavor. Also ordered were the Crispy Imperial Rolls ($8), with shrimp, pork, glass noodles, wood ear mushrooms, & chili garlic dipping sauce. You bite into this and every ingredient pops. Basa is certainly a place where small plates could make a meal. Diners could easily come here and order several tapas-sized appetizers and share them around. For entrées, we ordered the Japanese Eggplant ($16), with garlic chips, egg noodle, & aromatic wild mushroom ragout. This was a light dish, yet savory, featuring generous cuts of eggplant that remained firm. Clay-pot catfish, Tamarind broth, Imperial Rolls, and Japanese Eggplant. Then we did one of Basa’s signature dishes, the Caramelized Clay-Pot Catfish ($25), which was Monster! 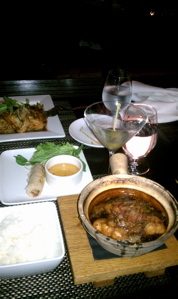 The clay-pot is a classic Vietnamese serving method, allowing various flavors to steep within. This variation included tender cubes of catfish, smoked bacon, tamarind broth, with Vietnames celery, bean sprouts and tomato. There is a bit of fish sauce flavor to give it a bite, but the smoky hints of bacon and caramelized sugars balance it out. Spoon it over a bed of jasmine rice and life is good. Basa was opened in 2007, by brothers Michael and Steven Ton, who emigrated with their family to the United States in 1975 from South Vietnam. 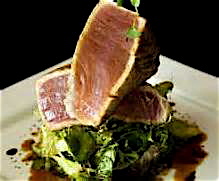 Steven specializes in restaurant management, and Michael is a French-trained chef, who studied his art at the prestigious Culinary Institute of America. It had always been their dream to open a chic Vietnamese eatery, and after working the Boston-New York restaurant scene for 13-years, Basa was the result. Nominated as a semifinalist for the James Beard award for best new restaurant, Chef Ton uses his kitchen as a crossroads, to bridge the cuisine from his Vietnamese heritage, with contemporary methodology and accents it with a French flair. “I’m not losing the authenticity of the Vietnamese tradition, just using better ingredients and putting a twist on it,” said Ton. 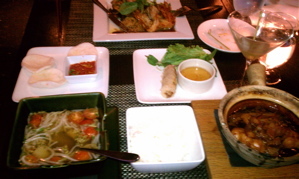 This entry was posted in Food, Reviews and tagged Basa, Michael Ton, Steven Ton, Vietnamese. Bookmark the permalink.